Raids by Danish vikings commanded by the infamous Hastein started in the former kingdom of Sussex. 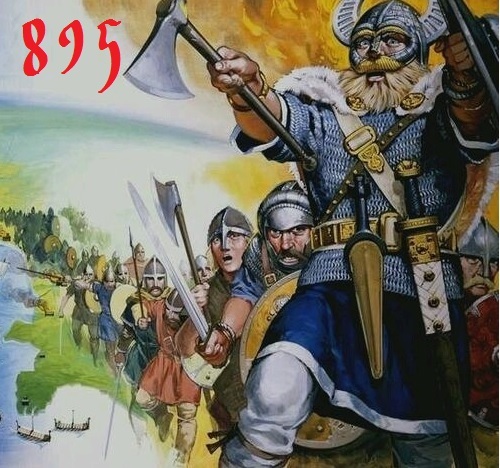 The Danes navigated the dragon ships up the River Thames and the River Lea and fortified 32 km north of London. A counter attack on the Danish vikings by a West Saxon army failed, but, Alfred the great managed to construct two forts at both sides of the river to prevent further progress of the viking ships. The Danes realized that they were outnumbered. They retreated north-westwards Midlands to a site on the Severn named Cwatbridge near Bridgnorth. Vikings were defeated by the Irish men of Louth and Ulidia, Vikings lost 800 men. Turf-Einar established the Møre family's sovereignty after Danish Vikings had settled. At Ranheim, about 10 km north of Trondheim in Central Norway. A pagan holy place existed.